And Everything Sweet: Pinkalicious Cake and Pinkalicious Ring Tutorial!! Pinkalicious Cake and Pinkalicious Ring Tutorial!! I've discovered over the past couple months that Pinkalicious is one popular party theme! This is my 5th request to make this cake, each time it turns out a little different and that's why I decided to post yet another Pinkalicious cake! 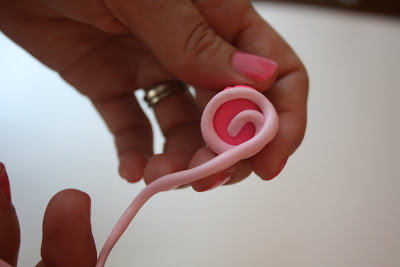 I have also received a number of requests for a tutorial on how to do the cupcake ring I created for Kate's Pinkalicious Party. 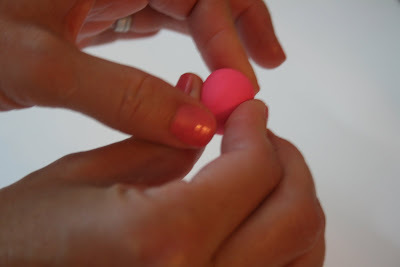 Its so easy, cute and such a great economical party favor!! So here is the long awaited tutorial. 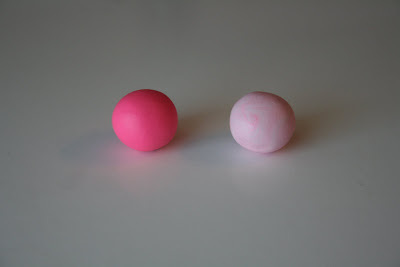 Start off with two shades of pink clay. I used Sculptey Polymer Clay. 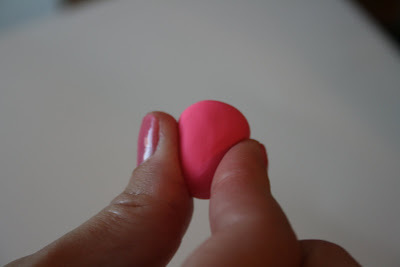 Knead the clay for about 2 minutes and then roll into a ball. 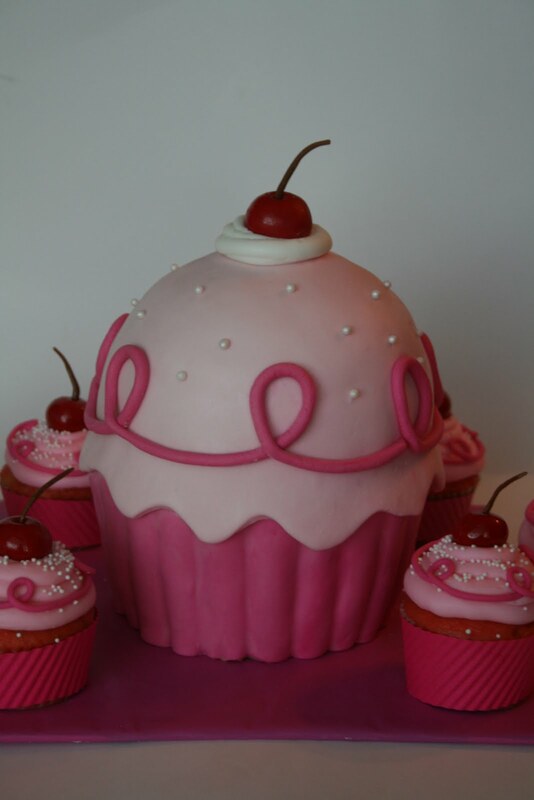 Start off with the darker pink ball, working it into a shape resembling the "cup" of the cupcake by pinching the bottom so that it tapers down. Rotate and continue to pinch the bottom so that it is even all around. Once you start to get the shape of a smaller bottom, start pinching the top and bottom to create a flat surface for both ends. Once you've achieved the shape you want, use a tooth pick to create lines to resemble the cupcake liner. 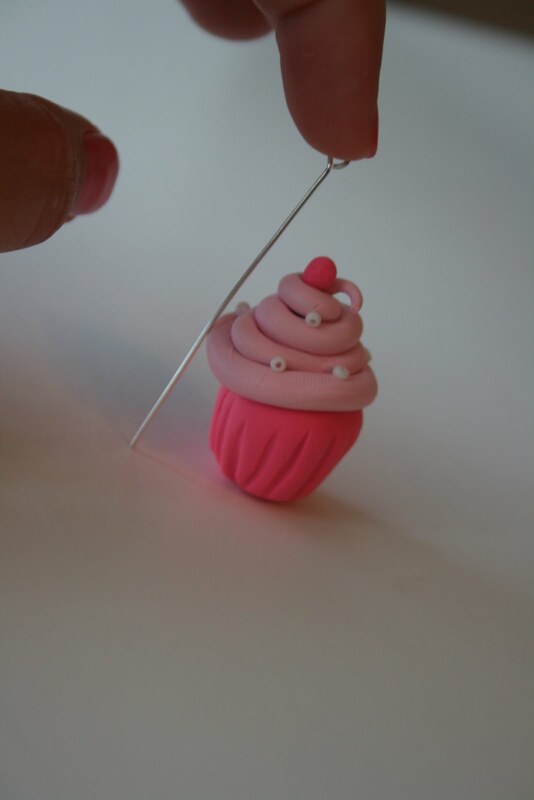 Now its time to FROST the cupcake!! 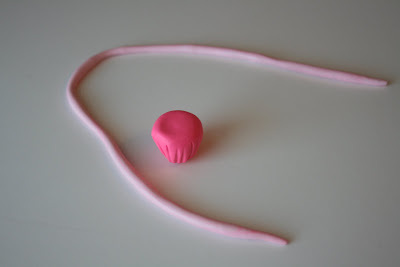 ;) Roll your lighter shade pink ball into a "snake". You're NOT going to use all of the snake...I rolled out to much. I used maybe 1/3 of this length. 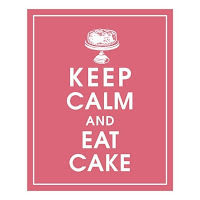 Keep winding around until you have the height of the "frosting" that you want. Just pinch off the remaining "snake" of clay. 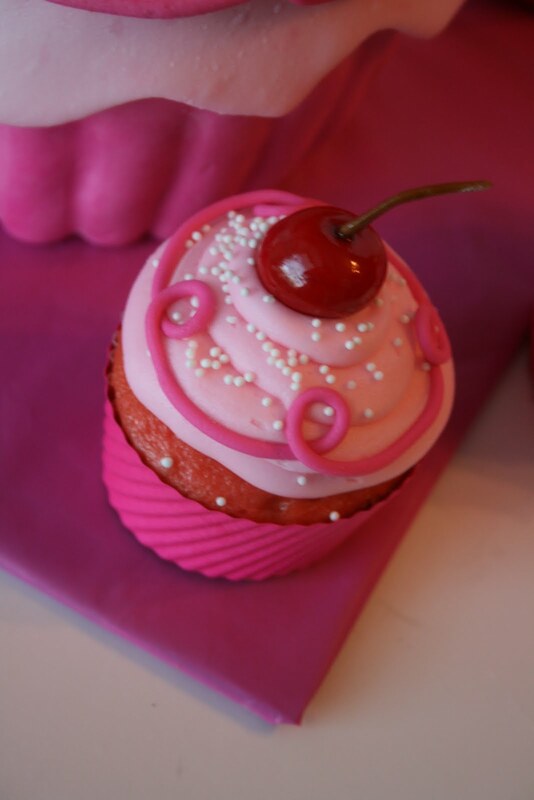 Top off with a cherry using a little ball of the darker pink. 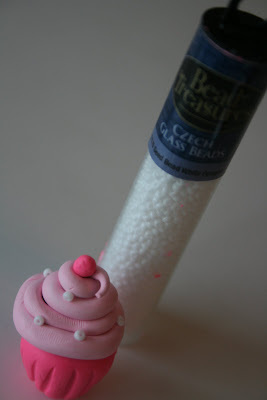 Add your "sprinkles" (tiny glass jewelry beads) by gently pressing them into the clay. 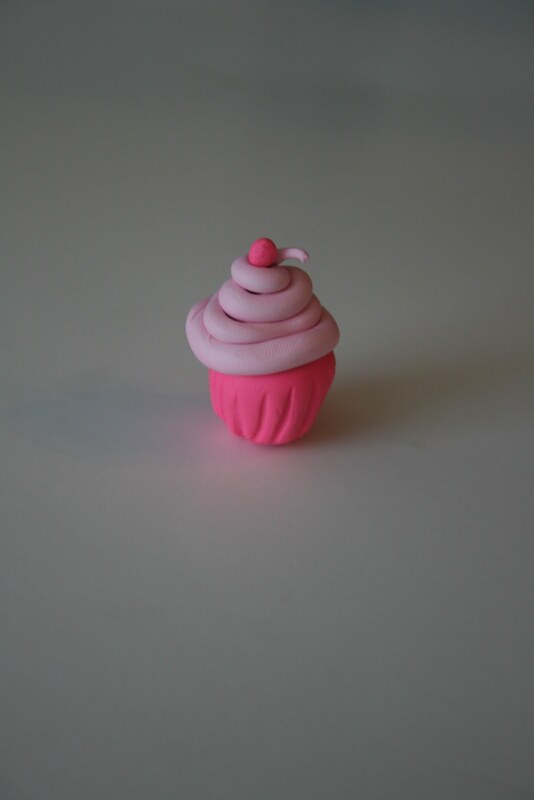 If you want to use the cupcakes as earrings or a necklace charm you can insert one of these into the top (just cut to length). If you want the cupcake to be a ring then skip this step. Bake at 275 degrees for about 15-20 minutes and you're done!!! You can always add a sealer to give it some shine, but its not necessary. Hi, I am throwing my niece a Pinkalicious party and I must say the girls would LOVE these rings. Where did you get the actual ring part of these? I've been searching and can't find any! Thanks so much! What did you use for a ring? These are super cute! Oh my goodness I just found your blog today and have spent the last hour being absolutely ENCHANTED by it! I have to force myself to get back to work but I could spend all day on here. ;) You are SO TALENTED - my hat is off to you! BEST of luck in all that you do!!! 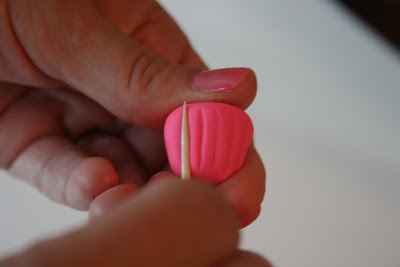 I LOVE this...and am going to do it for my daughter's pinkalicious party in March! Are these just rings purchased at a craft store in the jewlery section? Can you please advise me on how you attached them? What kind of glue? Thank you so much for sharing! Those are awesome and you are even more so for letting us know how to make them ourselves!